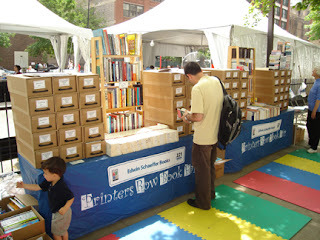 Last weekend was held the 23rd annual Printers Row Book Fair in downtown Chicago. “Printers Row” is historically Chicago’s area in which big commercial printing businesses and paper wholesalers set up; they are long gone, replaced by condos, hotels, restaurants, and other higher-margin businesses. 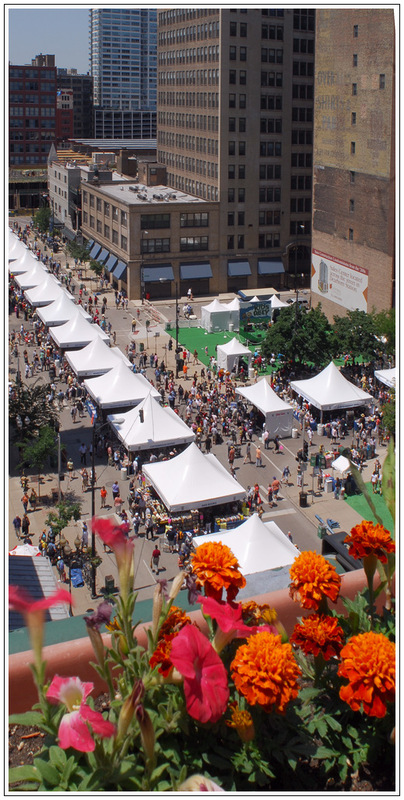 This Fair, principally sponsored by the City of Chicago and CHICAGO TRIBUNE (which provides extensive coverage and advertising and prints a pullout guide in the paper the week prior), features 20-foot square tents set up for several blocks on Dearborn Street (from Congress to Polk), with more tents extending either way on Polk Street. Here is a layout of the Fair. About 190 dealers, publishers, and book-related businesses rent 6-foot tables under these jaunty tents and and 8-foot sidewalk tables without cover. 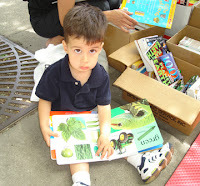 Numerous other events are part of the Fair, including dozens of author readings and signings, a “kid’s alley,” musical performances including the ever-popular and obligatory Chicago-style electric blues, cooking demonstrations, etc. C-SPAN always films parts of the Fair and airs at least one show about it. Simultaneously the Chicago Blues Festival was held a few blocks away, an enormous free event considered by many to be the best of its kind in the world. There were also diverse arts festivals and other such things going on throughout the city. Official estimates are that there are 100,000 attendees at the Book Fair annually, which has always seemed high to me, but having looked up and down the street for two days, seeing hundreds of different people each time, I think it may be a decent guess (see my photo of the crowd). The Fair has come a long way since its early days, and this is partially due to the sponsorship of the TRIBUNE and various other businesses such as Borders, Barnes & Noble, Ghirardelli, Jewel-Osco grocers, and Radio Disney. Naturally, this has led to grumbling in certain quarters that the original spirit of the Fair has been co-opted by big bloodsucking corporate interests, but there is no denying that it is becoming a bigger event as time goes on. This was about the 11th time I have sold at the Fair and I think it was my best ever. I normally take material of quite moderate value, often thousands of $4 books, as I am always worried about pilferage, rain, and other damage, but you can find books and paper items for sale well into four-figures at the Fair. I have lots of repeat customers, many of them students. Vendors will find this a good place to get rid of mistakes, stuff that is too much trouble or too cheap to ship, and those pesky books that pile up as box-lot leavings. Or material in areas they have decided they don’t want to carry anymore. This year I had scads of classics in literature, philosophy, drama, history, poetry, etc., as well as a slew of DK kids’ books bought in a closeout. Anything and everything sells at Printers Row. Fiction/non-fiction, paperbacks, rare first editions, prints, arty matted magazine pages, postcards, posters, old newspapers, bookmarks, ephemera of every kind, VHS tapes, whatever. I met a fellow named Peter Nepstad who had a table selling his computer game mystery based on the 1893 World’s Columbian Exposition and he seemed quite pleased with his results. Fortunately for me, you don’t have to worry about whether you have an orderly display. I have sold stuff that I never in a thousand years would have counted on to go, especially to the specific people who bought it. One buyer I remember vividly was a guy who looked homeless, but he bought an old scholarly scientific book on the genetics of twins. I have had folks who looked like impoverished single moms or Hell’s Angels joyfully buy bags full of Shakespeare and Plato. All this in a happy book-party atmosphere, with restaurants serving cafe-style on the sidewalk, beer carts set up, and Edwardo’s pizza selling single slices of its marvelous deep-dish pizza for $3. The weather was absolutely unsurpassed, which was the case last year as well; in previous years there has been some rain, but as the Fair is now held about a week later into the summer, this may have something to do with it. I heard anecdotal evidence that one large dealer grossed $40,000; whether that is true or puffery I cannot say, but I certainly was flat-out busy for the full 8 hours a day selling like mad. If you want to be considered for a table at next year’s event, email Maggie Wartik of the TRIBUNE to be put on the list. You will want to return the application either by FAX or overnight mail on the same day you receive it, as the Fair gets oversubscribed more and more each year. Please email me at if you have any questions.